History: Created by a volcano 10 millions years ago, Tenerife was originally inhabited by the Guanches, which were a cavern tribe originally from African. Until the arrival of the Spaniards the Guanches had been living in peace with their prehistoric customs and culture. The Spanish forces began their conquest of the Canaries in 1402.The islands fell one by one, the last one being Tenerife, which was finally conquered after heavy Spanish losses in July 1496. Under the guidance of the newly installed Spanish leaders, the islands quickly asserted themselves as the major commercial trading links between Europe, Africa and the 'new world' of America, and so remained until the 20th century. 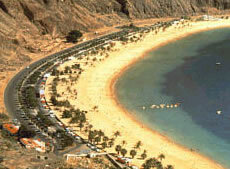 Attractions: The Canary Islands is characterised by its volcanic scenery. The island´s most emblematic natural landscape has to be Mount Teide, the highest mountain in all of Spain. The assembly of strange forms and colours of solidified lava, exclusive flora, and the geological singularity make Teide National Park the most visited one in Spain. 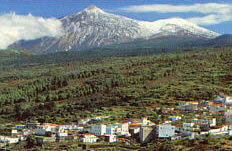 The northern part of the island, traditionally known for agricultural, is a lush green carpet that runs from under Mount Teide to the sea in the North. The most important historical places are also located here, among them are: La Laguna, the former capital, now the university center is full of buildings from the XVII century. Icod which is famous for its wine and for the thousand-year-old Drago tree and the fertile Orotava valley are also located in the North. The southern part of the island presents a landscape, which contrasts surprisingly with the north. The oceanic clouds are trapped by the high mountains in the interior and cannot continue towards the south. For this reason, the southern area is always sunny, and as a result, the arid landscape reveals multi-colored lava and desert-like vegetation. This part of the island is perfect for relaxing on the beach, swimming in the sea, practising water sports, like windsurfing, surfing and diving. Those who visits Tenerife during the month of February should not miss the Carnival of Santa Cruz, worlds second best after that of Rio de Janeiro. During this period, all inhabitants get their costumes out, the best Salsa groups invade the night and they cover the city with colour and spectacle! Going Out: Tenerife has a very vibrant nightlife year-round. The nightlife starts around 10 pm. where people go out for dinner. All over the Islands there are small taverns or restaurants where you can find something enjoyable to eat (we can recommend the 'tapas' and the local food). After dinner you can continue having a drink in an open-air bar or a salsa pub. And if you still want to party, you can dance until dawn in the many clubs located in the tourist areas (Puerto de la Cruz in the north or Playa de las Americas in the south). For more information about Tenerife see the Tenerife Guide.